I’ve been trying to get more comfortable with speaking to groups. I took an excellent 3-week public speaking seminar last year to help me learn important things like posture, confidence, organization… and not flipping off your audience through the whole speech. I accidentally did that once. What I loved most about the class was the importance the trainer placed on knowing your audience. We spent a whole session answering questions about the people who would potentially be sitting in our audience: Why are they there, what other activities might they be missing to hear me speak, what do they really want to hear from me, what will turn them off, what things do we have in common, and so on. This was a pretty familiar concept for me because we did this all the time in our content strategy engagements with clients. The cool kids call it buyer profiling. Whatever you call it, it is an essential step to developing a content marketing program that will actually help you meet your goals. Cards on the table, buyer profiling isn’t easy. But to follow up on my last post about demystifying and simplifying the content marketing process, this post will show you an easy process for learning everything you need to know about your potential target market without spending a ton of time or money. If you or your company/clients have been in business for a while, you probably already have everything you need to go through this process with ease. But even if you are new to the content marketing game, you shouldn’t have much trouble implementing the process. Ladies and gentlemen, chuck your spreadsheets! I’ve participated in my fair share of “market research” projects where clients would spend embarrassing amounts of money doing mass-scale surveys, hiring telemarketing companies to do phone surveys, and buying lists upon lists of data about potential targets. Here’s what I learned: Spreadsheets filled with data give me the hives. The new media environment isn’t about blasting your marketing message to the masses and hoping your target audience is seeing it. It’s about connecting with your audience — in some cases on a one-on-one basis — matching their needs with your relevant solutions and multiplying it all by the massive reach of the Internet. That’s where the sweet spot is. So if content marketing is about making personal connections, why would we choose to do our customer research on a mass scale? I bet you already have some sort of client or customer database or email/ mailing list. I’m going to show you a very simple way to develop your buyer personas with the data you already have. In fact, I helped a small marketing agency customer with this exercise so I could better explain the process. Here’s what we did. *Disclaimer! Before you get your analytical pants in a twist, I know this process isn’t scientific. But neither is producing good content. That’s why it’s called an art. Step 1: Find your “top 20 percent.” We started by running a few reports from their Quickbooks account (but any customer database should work) to take a look at which clients had hired them and what work they hired the agency to do, as well as the amount of revenue that each project generated. Then, to make the numbers manageable, we looked at the top 20 percent of clients that contributed the highest percentage of their business revenue. This agency tends to be picky about the client projects they take on, so they had a smaller number to start with. If you have a large number of customers to look at, I suggest starting with your top 20 percent of customers (in terms of revenue or another relevant qualifier), then narrow it down to a smaller percentage that gives you a manageable list size to analyze. Maybe this is your top 10 percent or maybe 2 percent, depending on the number of customers you have. Are they a decision maker? If so, what do they base buying decisions on (e.g., lifestyle — environmentalist, baby boomer, etc.)? If you don’t have much information on your customers, just focus on the things you do know: Maybe you know where they live, whether they’re male of female, or whether they are cat or dog people. Use this information to determine your key characteristics list. Step 3: Find the commonalities to find your different segments. Then I reviewed the information about each of the top 20 percent clients and looked for any details that jumped out. As I read through the data, I discovered that most of these clients were either business owners with no marketing staff or corporate marketing managers who either ran their departments alone or with the help of one other person. Interesting! I think we just found their customer segmentations. As you look through your data, take note of any patterns that begin to emerge. What customer characteristics keep showing up? Did some specific “types” of people emerge? Are your clients mostly engineers? Mostly women? Are there a lot of middle managers on your list? Write these distinctions down to use as your buyer categories. Step 5: Give them “life!” Find an image that can represent each one of your different buyer types and give each one of these types a name. Then, based on the questions you answered for them above, start to create their stories. For example, build a career history for them, include relevant details of their personal lives that explain why they are so busy, how many activities they are juggling at home, or any other specific interests they are likely to have. You can even include the content delivery mechanisms that they might prefer and why. And voila! You have your profile! Bonus Step: If you want to get more scientific or you have little personal experience with anyone on your user list, (for example, if you work for an Internet business or a gigantic corporation, you might not have direct exposure to your customers) here’s a ready-to-go customer survey template that you can use to gather information from your customer/client list. The last thing I took away from my public speaking class was to wrap it up. Once the marketing agency had a clear (and literal) picture of who its target client was and what they wanted from their agency, we developed their content strategy. Since clearly identifying their ideal, target clients, and building their content strategy to serve them, this little agency has seen significant increases in quality website traffic and more inquiries than they can keep up with. 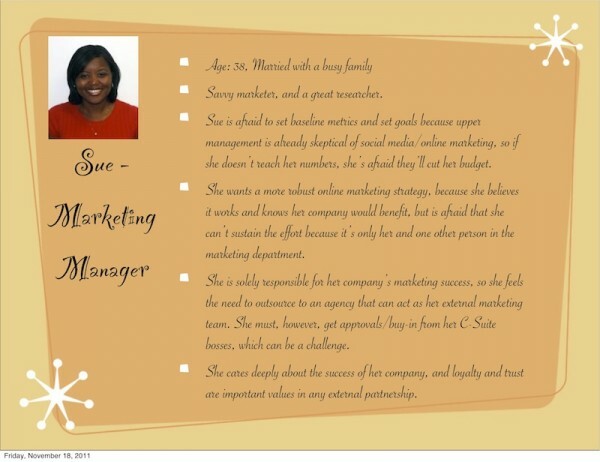 Put the personas you’ve created in a document, print them out, and hang them on your wall (see another great example here from Barbara Gago). Every time you sit down to craft a piece of content, look at them and remind yourself what you’re really trying to do with your content marketing programs — connect with these people in a valuable and meaningful way. If you have any suggestions to add to my buyer profiling process, or information you’d like to share on how you try to stay connected to your audience, I’d love to read them in the comments section below. Jayme is on a mission to take her simple approach to content marketing to the masses. Growing up on her family’s farm in rural Kansas taught her a lot about being able to appreciate life’s simplicities. Those ideals are now inherent in her career, first as a copywriter, then as a content strategist, now as the co-founder and CEO of DivvyHQ, the simple, spreadsheet-free editorial calendar application. DivvyHQ was created specifically for content managers who manage multiple projects, clients and teams and are longing for a simpler solution. Follow @jaymethomason on Twitter and @divvyhq or email her at jayme@divvyhq.com.